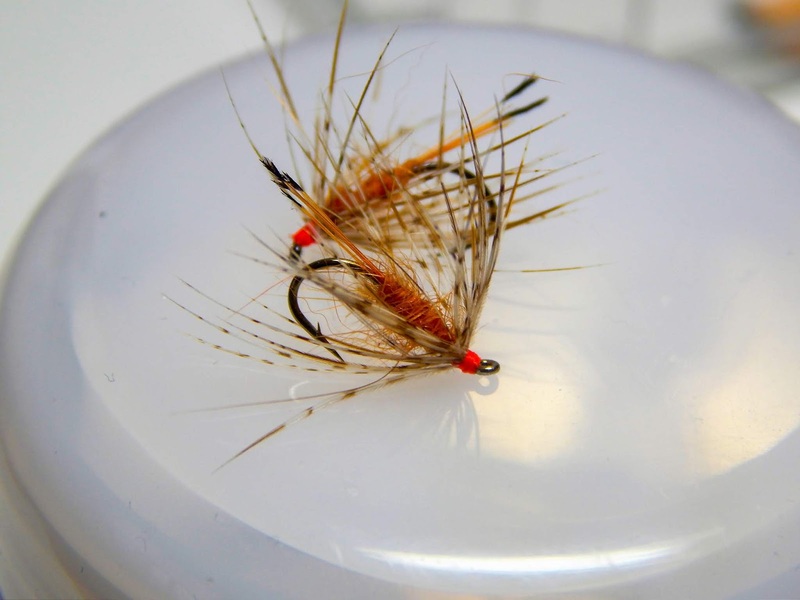 As fly tyers and fly fishers we have lots of patterns to work with. 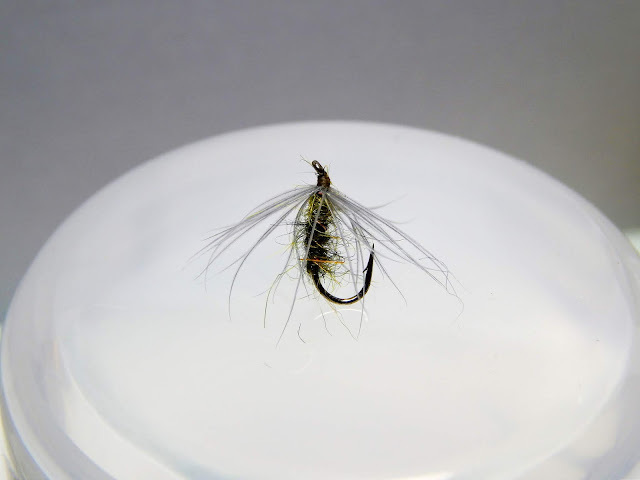 I have several books on wet flies, spiders, flymphs and nymphs. In many of these books the patterns show flies tied with a tail and flies tied without a tail. In my own tying I find that most of the flies do not have a tail. 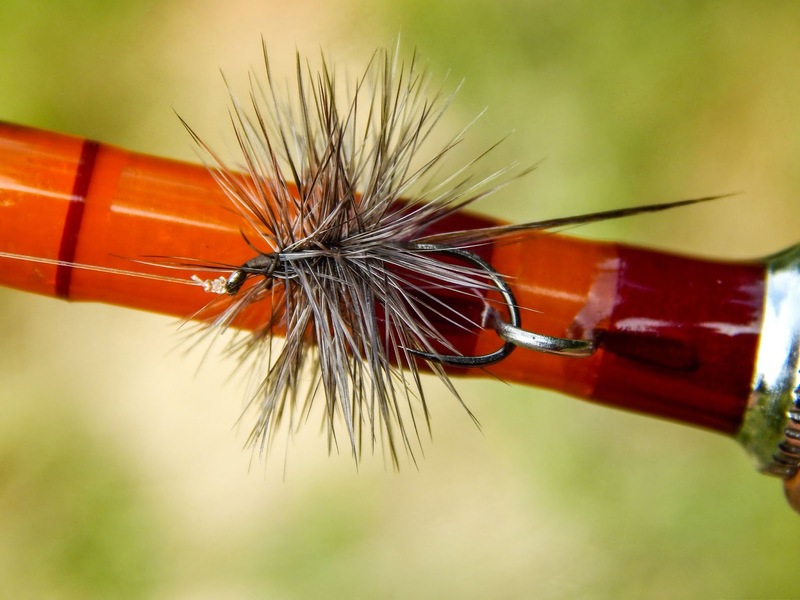 One book I work with named Fly Fishing Soft-Hackles by Allen McGee has many patterns featured and going through them I would say half of them have tails and the other half have not. Tails on these wet flies from my experience serve no purpose in the effectiveness of a wet fly. The overall look of the fly changes and that change is in the length of the fly. 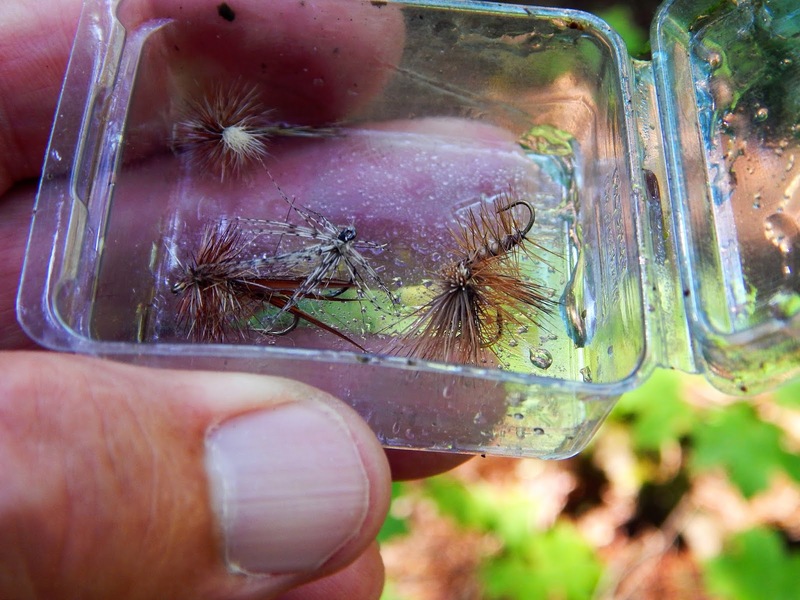 Below are a group of wet flies and soft-hackled emergers. Some are tied with tails and some with out. 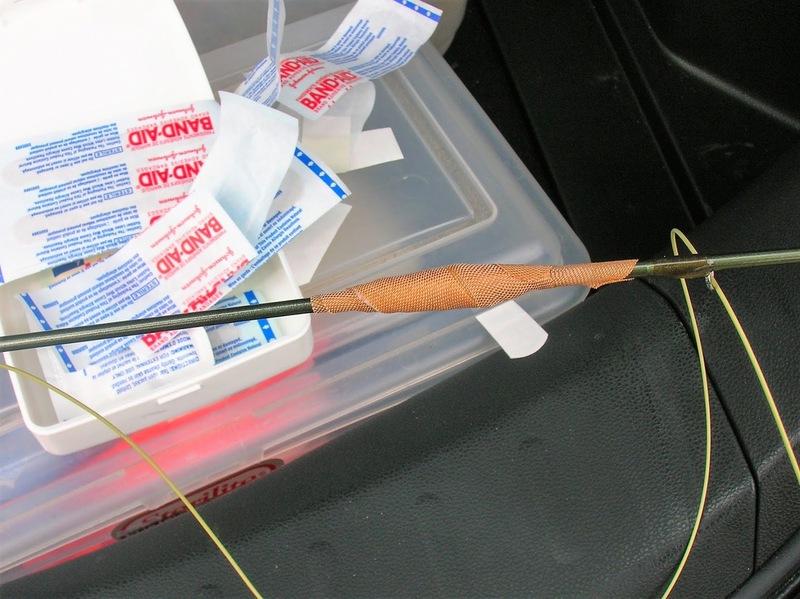 What are your thoughts, and what do you fish more often, tail or no tail? Sunset Sunday evening...so beautiful. With that I expected Monday to be a fairly nice day, and it was for some but not to me. Clouds thickened as I drove to the stream I chose to fish, and soon those clouds deposited some rain. The rain was very light and spotty as I drove and I was assured by the local forecast that it was not going to persist. With the clouds and rain there was also a damp chill in the air and a flannel shirt and rain jacket was needed to make me feel good. The drive to the stream was not long, perhaps 50 miles and when I pulled over onto the dirt parking space I could hear the stream. 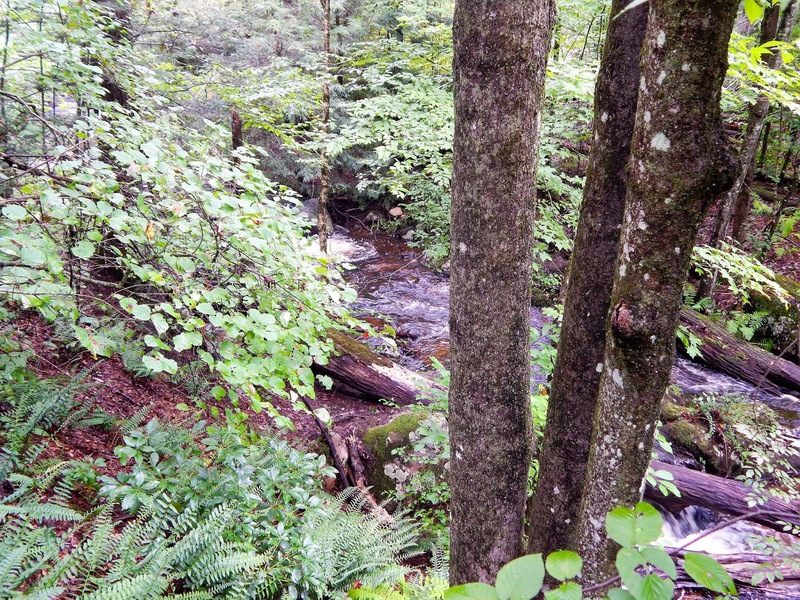 As I walked the path through the woods I could hear rushing water, it got louder and louder. There it was, a small stream full to the brim. The gentle flow that I was used to did not exist. I said to myself this was going to be a tough outing. I fished the stream giving it my best, but to say it was difficult would be an understatement. So I made the decision to try another stream which was about 10 miles away. This was that stream...totally opposite from the stream I just left. This stream has several deeper pools and that's where I fished. 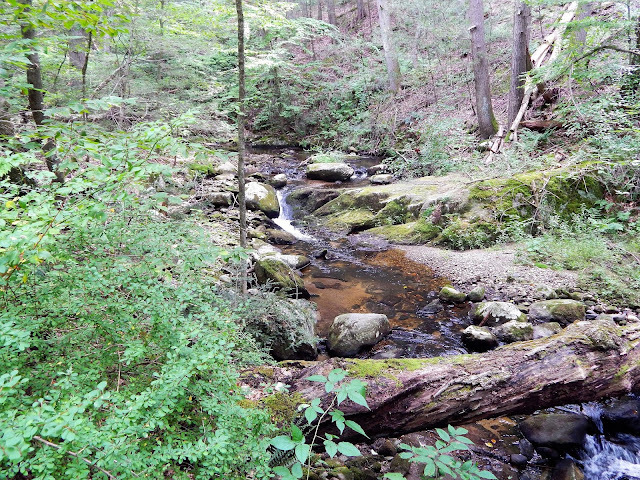 The brookies were very receptive to my offerings and I really enjoyed the rest of the outing...what a difference 10 miles made. 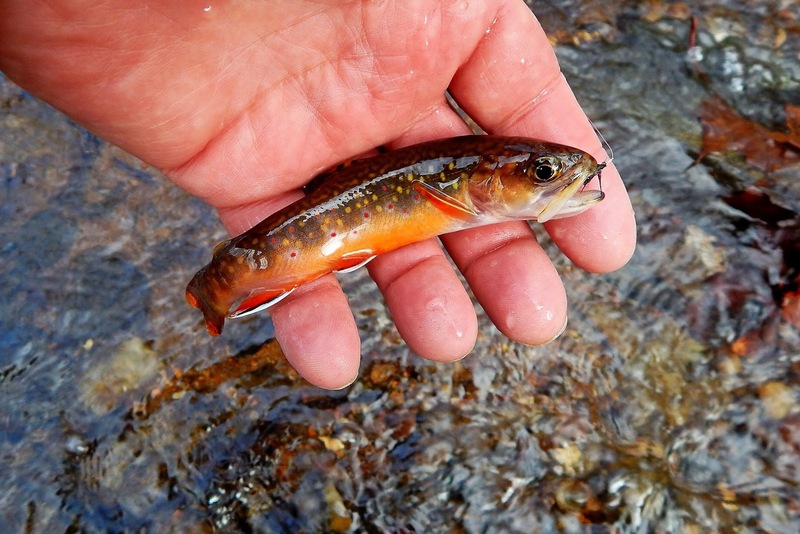 The brookies were sized according to the stream. One fly was all that was needed...a Cinberg. 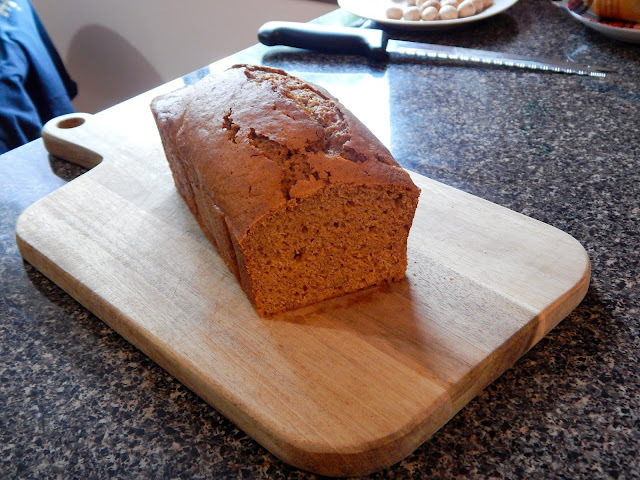 Pumpkin bread, grilled in the pan with butter. The apple harvest is going on and the crop looks to be awesome. I love apples and enjoy them in many ways, but my favorite is the apple pie. I'm not a pie maker myself but I dabble with apple breads and crisps. 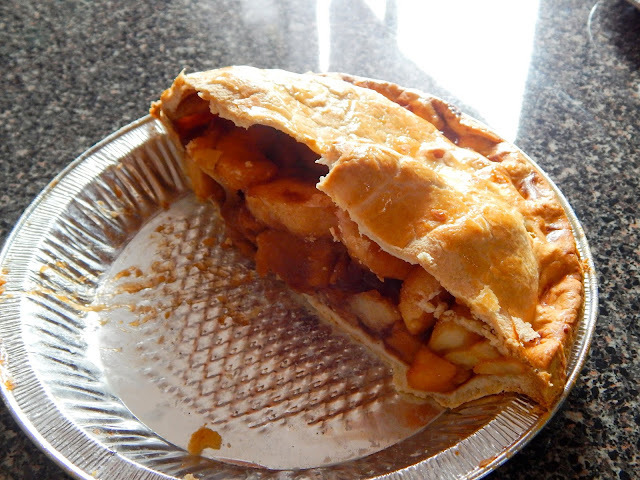 When I want a traditional apple pie I drive to Lymans Orchard and purchase of of theirs. They have a pie that's loaded with fruit. They bake them to perfection, and they are not to sweet. 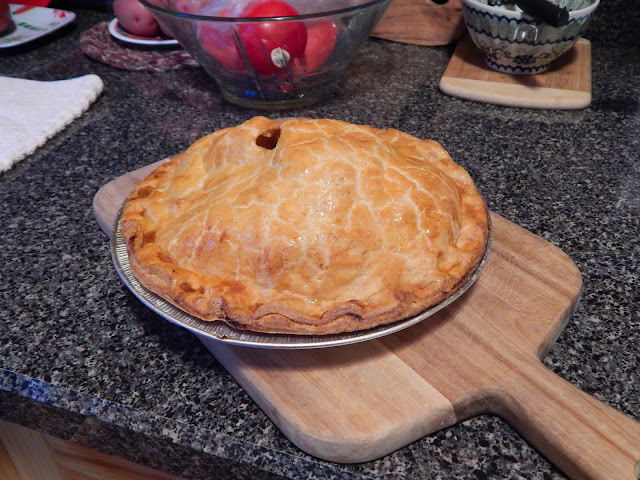 Apple pie must have a tartness to it, and not be full of thickeners like cornstarch...do you agree? I like my apple pie cold right out of the fridge. 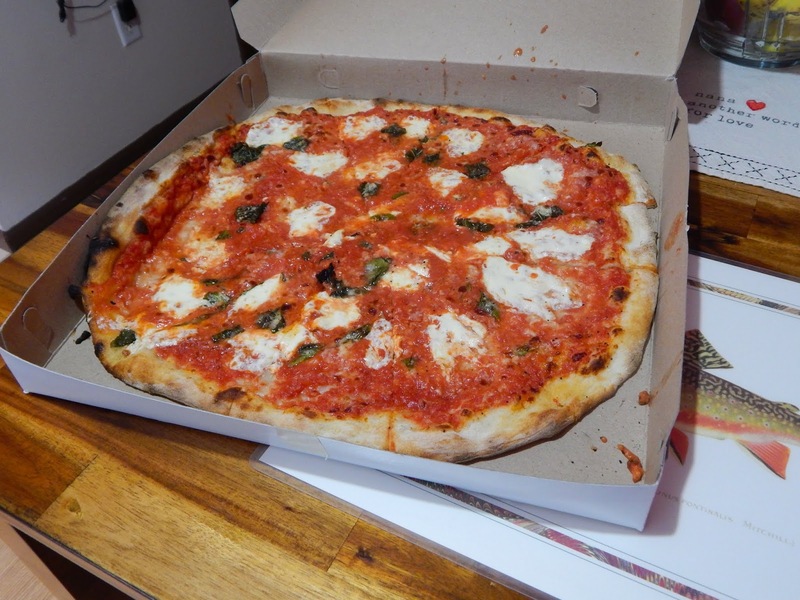 But room temp with some ice cream would be OK.
A Frank Pepe pie....pizza Naples style. A thin crust, fresh plum tomatoes, fresh mozzarella, and basil. 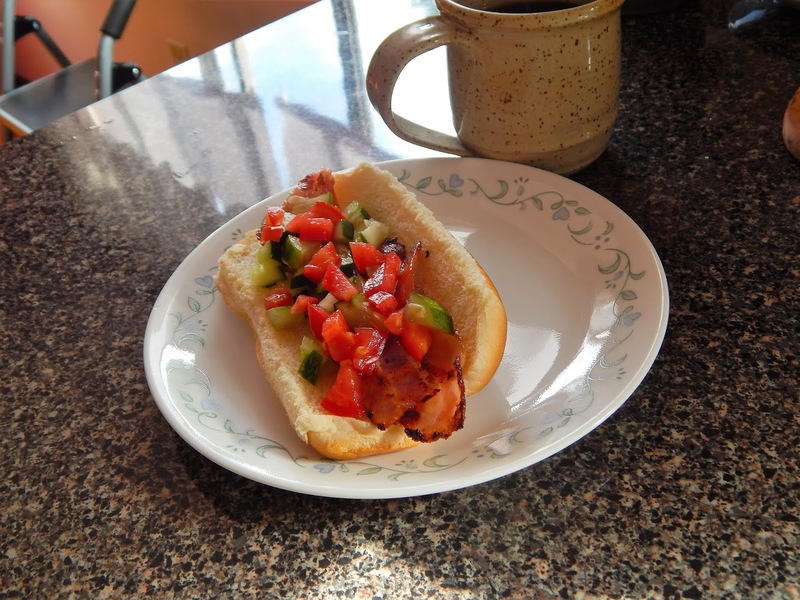 I like a light charred crust, some like it slightly darker. After so many years of fishing small streams I should know that surprises happen. Some come in the form of lots of fish, a brookie or brown taking a fly that it really shouldn't. There are the times when I slip and fall in and find out I did not break a leg. Cold snowy days when the trout are rising to "bombers", and days when coffee from a thermos that really tastes good. Today, I found out something that I suspected but never experienced. While fishing a blue line I noticed a smaller blue line feeding into the one I was fishing. Looking into it I saw quite a few brookies. 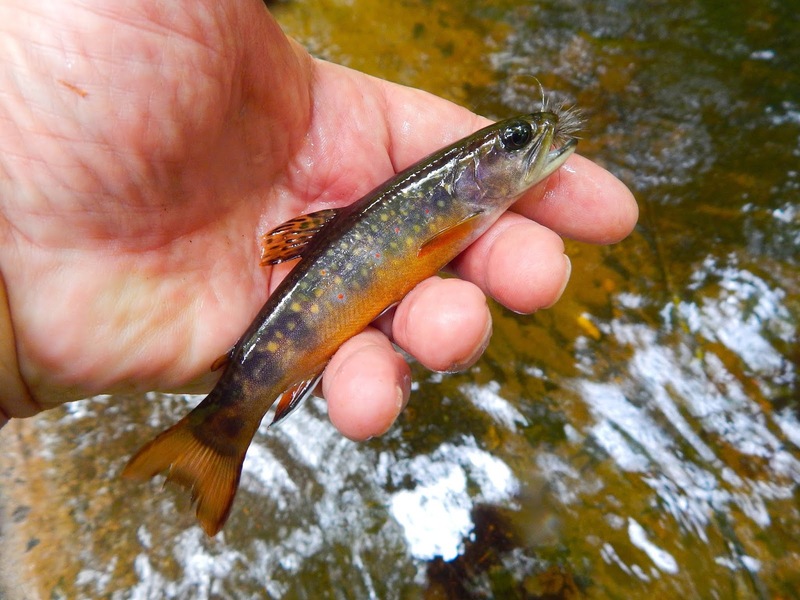 It's said as the streams rise this time of year they tend to draw brookies up into them. I think they seek these waters to spawn. Now I'm not one who will not say that's just a stupid idea, I mean what if they dry up. On the other hand these fish have been doing this for centuries and have survived just fine....so what the hell drift a fly, I did just that and once again I was gifted. 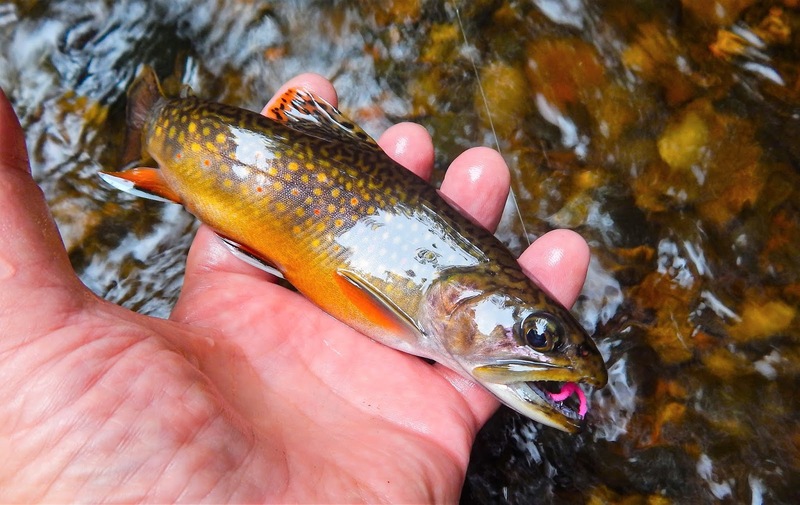 Now friends take a good look at this wild brook trout. A spawning male with a hump in his back, orange, blue, yellow, red, black and white colors mixed into his body. An incredibly strong fish who rose to a Ausable Wulff and bent the heck out of my 5' 3wt....a fish that did not surrender and as I lifted him up to take a photo he twisted and freed himself of the fly....moments later he was gone. This is a memory never to be forgotten. 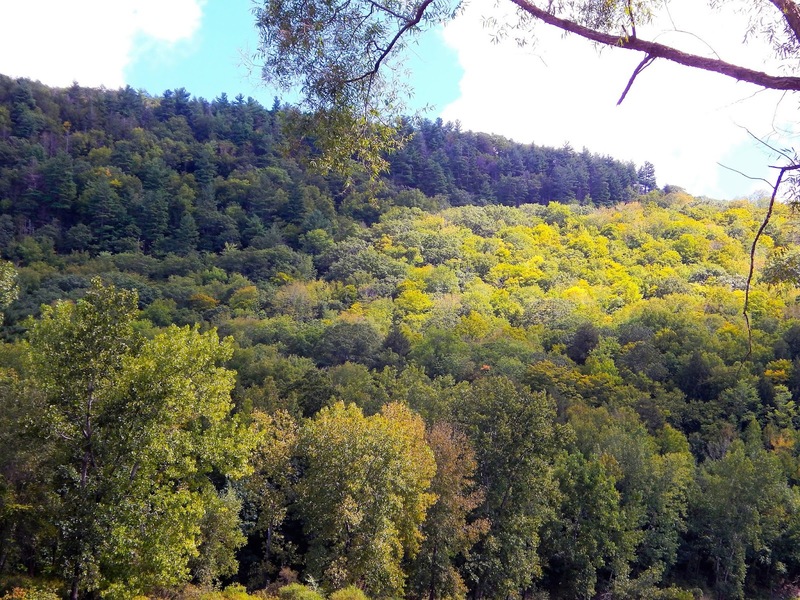 What a photo...clearly the seam between evergreen and hardwood stands out with color starting to show in the hardwoods. Along that seam is a stream that flows into a large lake. In that stream are some of the prettiest brook trout in New England. 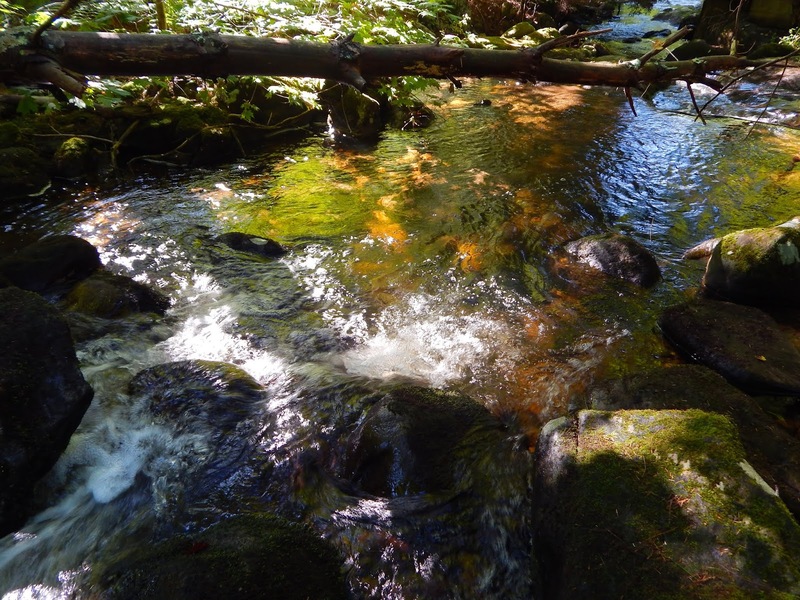 Recently I spent some time fishing the stream at a time when it was flowing sweetly. We have had ample rains and when time permits I'll fish these little waters and take advantage of higher water moving brookies about. The stream passes through some nasty places, nice for photographs but a little steep for this guy to trek down. I'll move along until I find more friendly access. 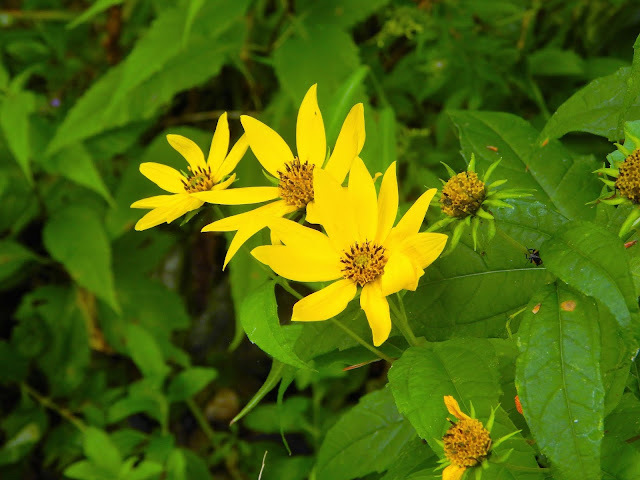 Lot's of flowers about with sun bright color. 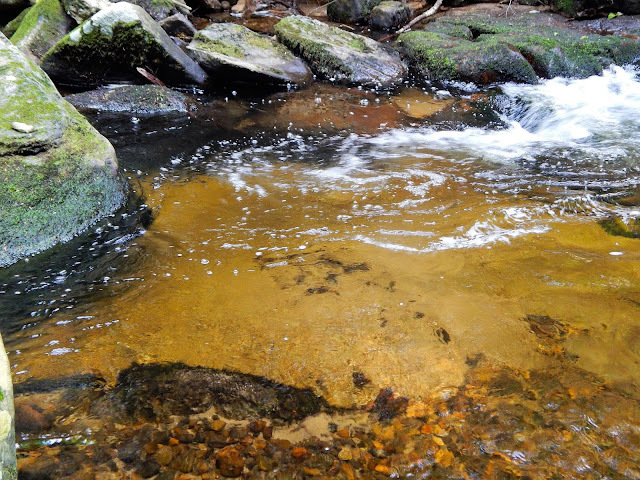 The brookies in this stream will not be outdone....their colors rival any flower. 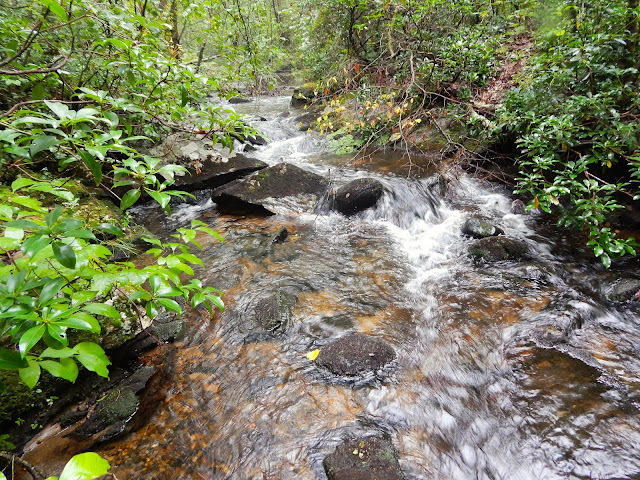 Fast moving water leading into a deep pool. I love fishing these places. Usually these places hold some nice fish like this one. I wonder what lurks in this pool? Skater-spiders are a variant of the Hewitt "Skaters" which were created by Ed Hewitt back in the thirties. He used these flies and I might add many others as well to take trout on the rivers in the Catskill's. The "skater-spider" was created by Ed Shenk of Carlisle PA. 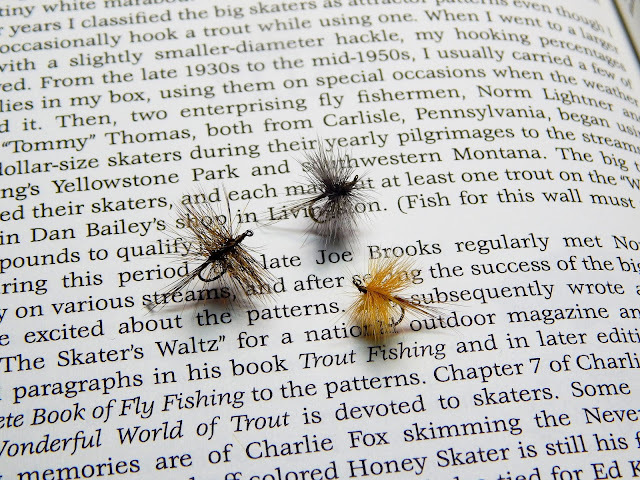 I found the chapter on these flies in his book "Fly Rod Trouting"...it seems Ed was tying these flies for Joe Brooks who used them quite successfully. 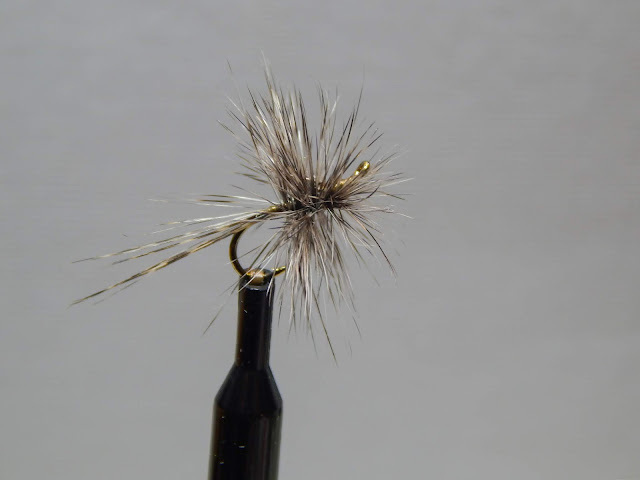 Shenk's flies used a typical dry fly hackle where Hewitt used "spade hackle" which are very hard to get. 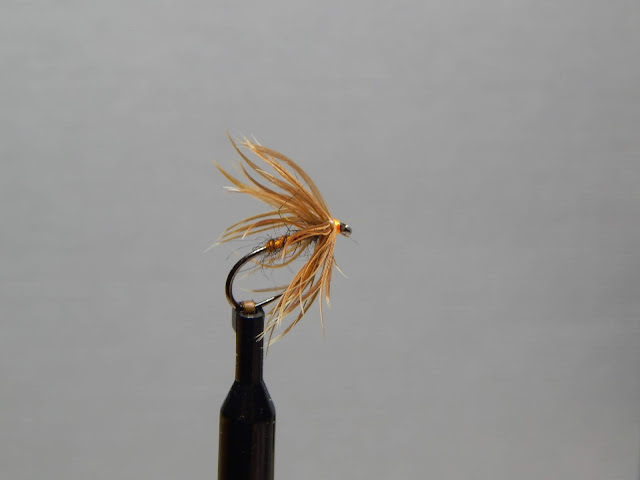 I tie a variation of Shenk's fly. I use a tail. I'll tie these in size 14 and 12. 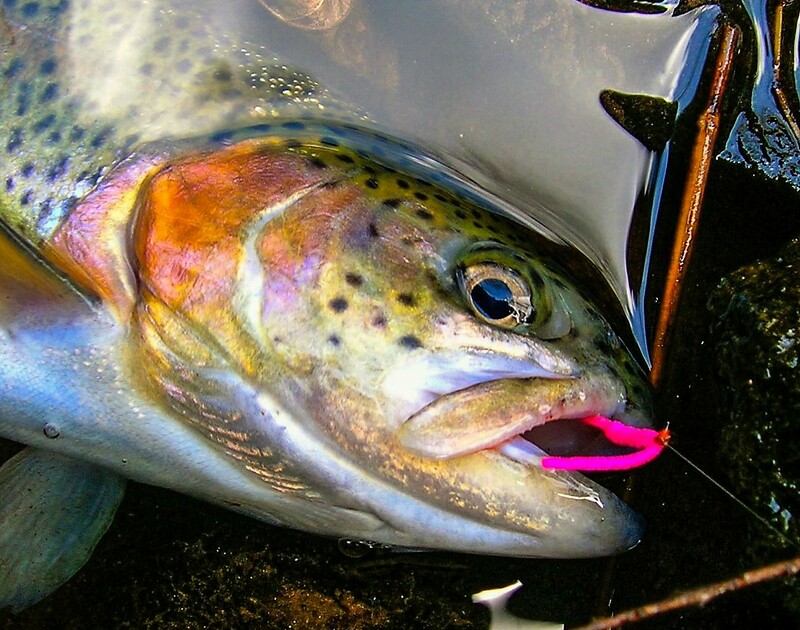 As far as colors are concerned I don't really see a difference and the trout take any color. 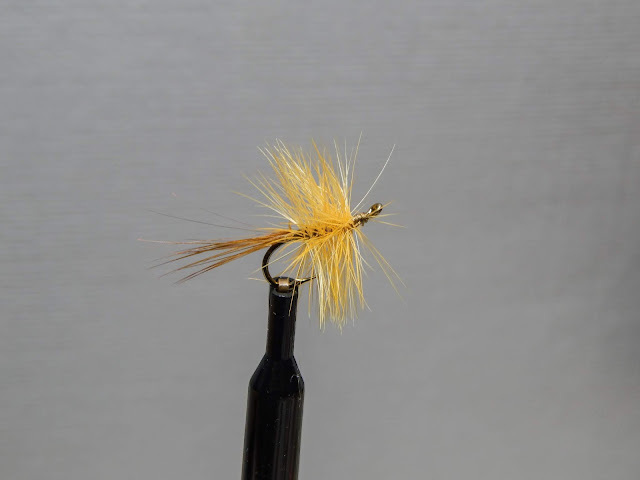 They are a simple fly to tie, requiring only thread for the body, a few coq de leon fibers for a tail and the hackle. I use Whiting 100 packs...the flies have oversized hackle 14 and 12 I use size 10 hackle. 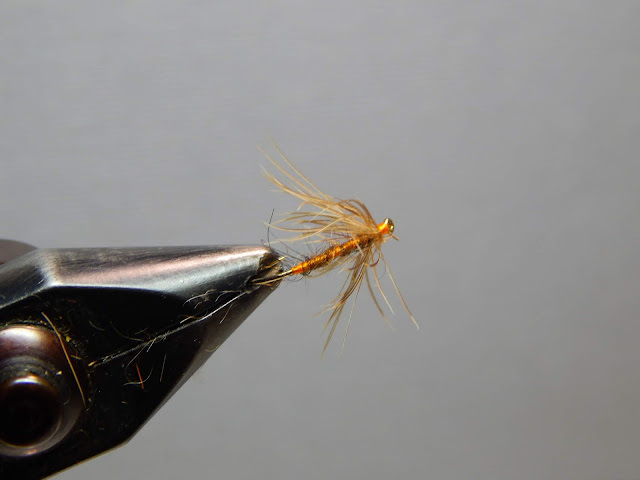 This skater-spider uses natural grizzly hackle. 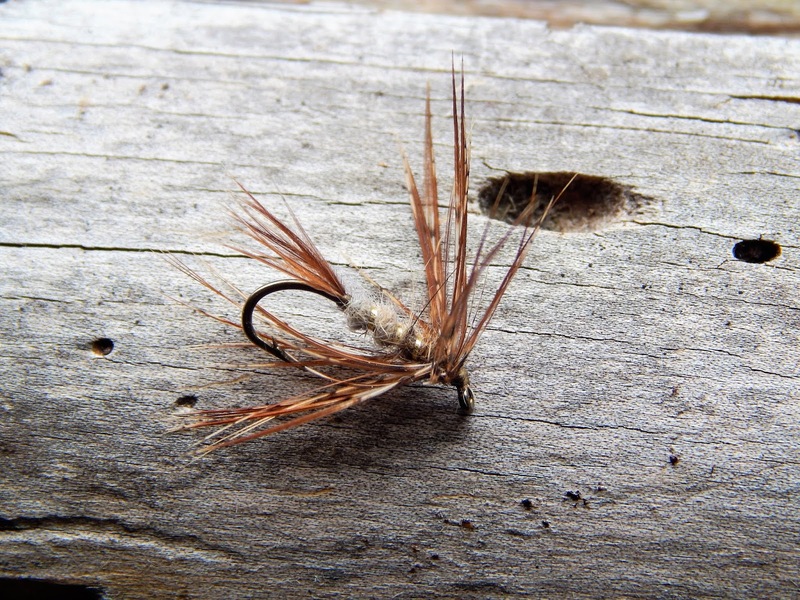 This skater-spider uses what Whiting calls grizzly/ march brown hackle. 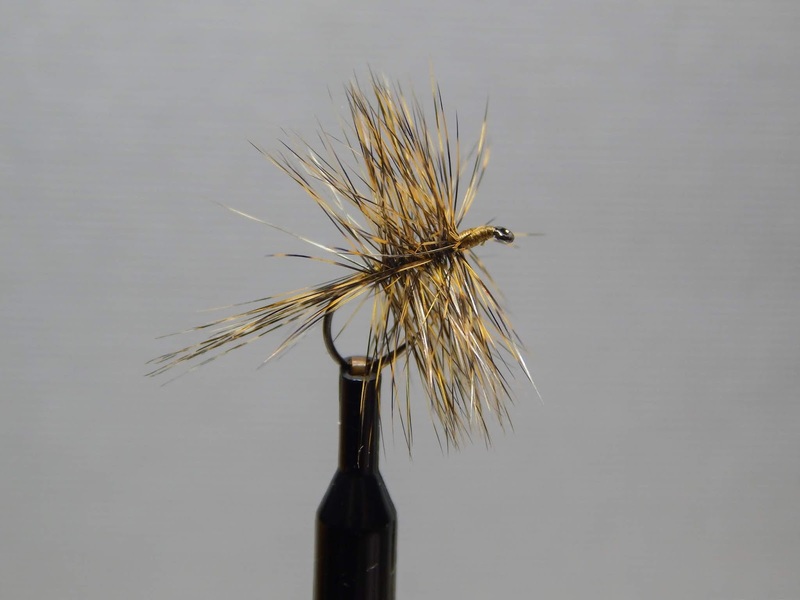 This lightly colored skater-spider uses brown hackle fibers for the tail and ginger hackle. While these flies are not the most visible on the water to anglers the fish see them well and that's what matters. Monday and Monday night we had some pretty decent rains. This was well needed and I was anxious to see the stream levels, as well as how the fishing would be. Small streams rise quickly and fall almost as fast. 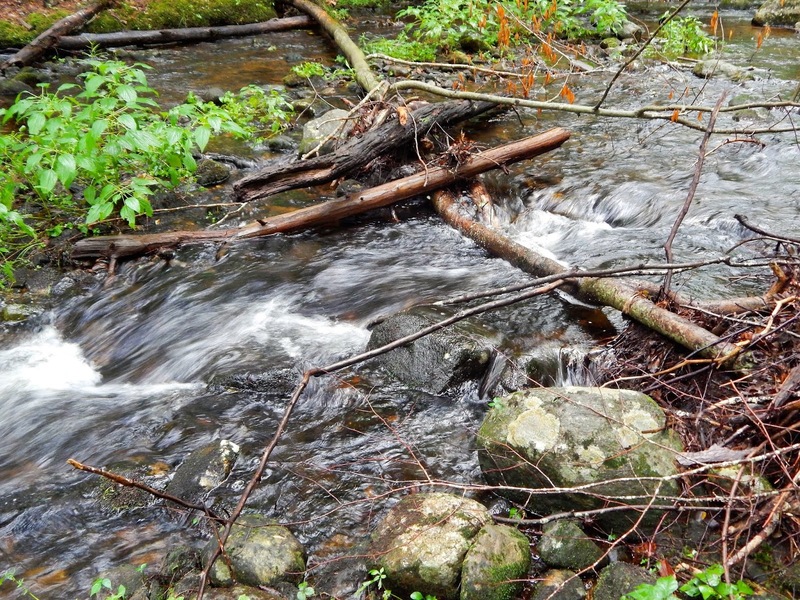 In each stage the stream can become somewhat dirty and cloudy but will usually clear up before to long. 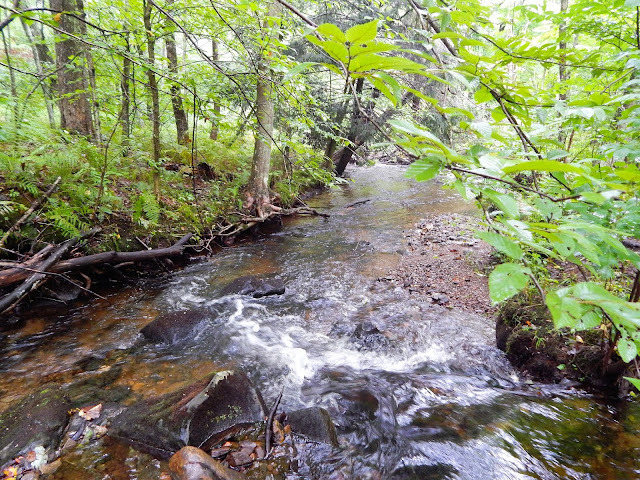 The places to fish when this clearing process is happening are the riffles. 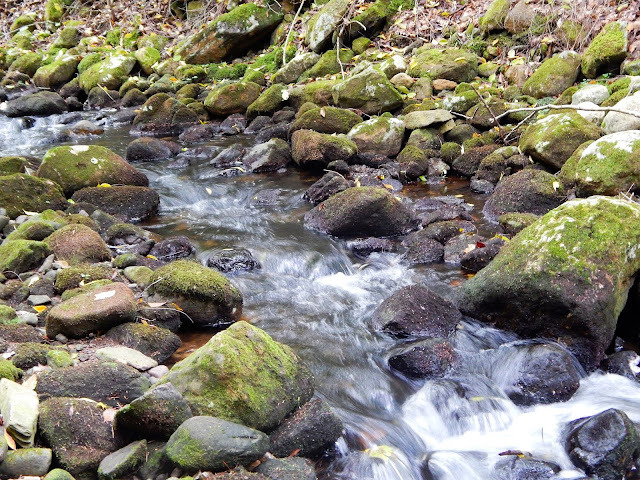 It is these areas where the cobble bottom and faster flow clean the water to almost perfect conditions. Such was the case yesterday when I took to the woods in search of some willing brookies. 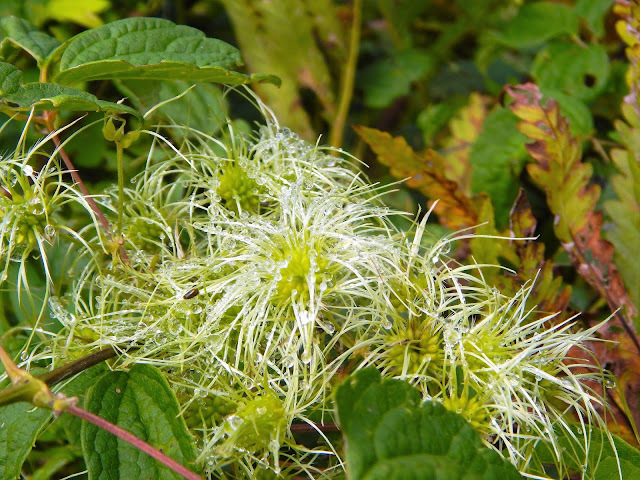 The air was damp with the spattering of rain from time to time. A few instances the sky brightened for a minute and soon the clouds took control. The streams bottom doing its work of clearing the water. 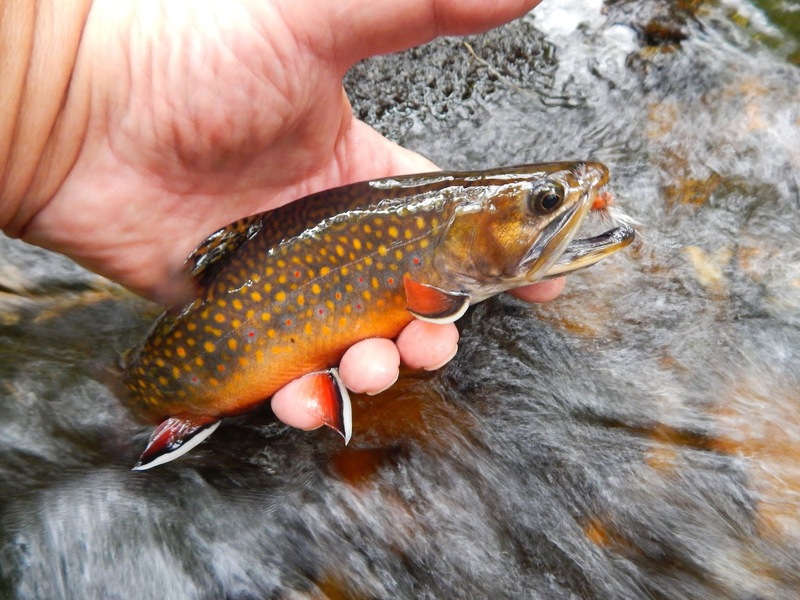 The brookies were active with several taken in a few minutes. 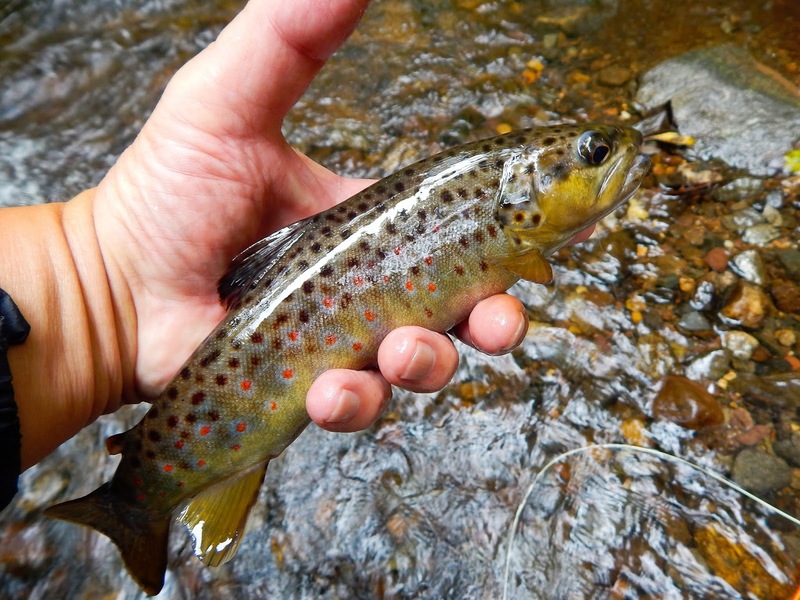 ...it did and this beautiful wild brown was at my feet. As he lay there I reached for him, I slid my hand under him and lifted him. A quick photo and as I placed him in the water I could see the fly had come out as the fish lay in the water before I lifted him up. A few moments later he swam off. ...where the wild jewels are found. More on this fly later. A fly tying challenge and a wonderful story. 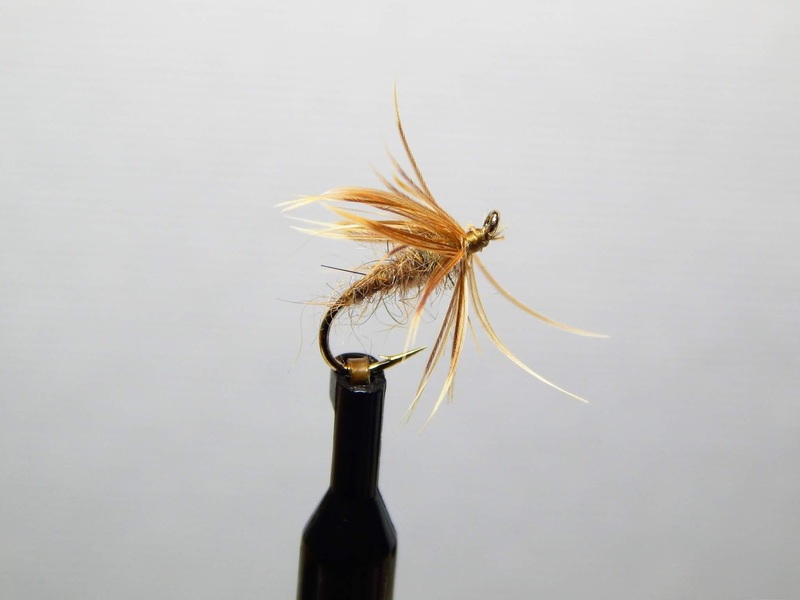 I spent some time at the tying desk yesterday afternoon tying up some very complicated flies. I must say that it was exhausting. 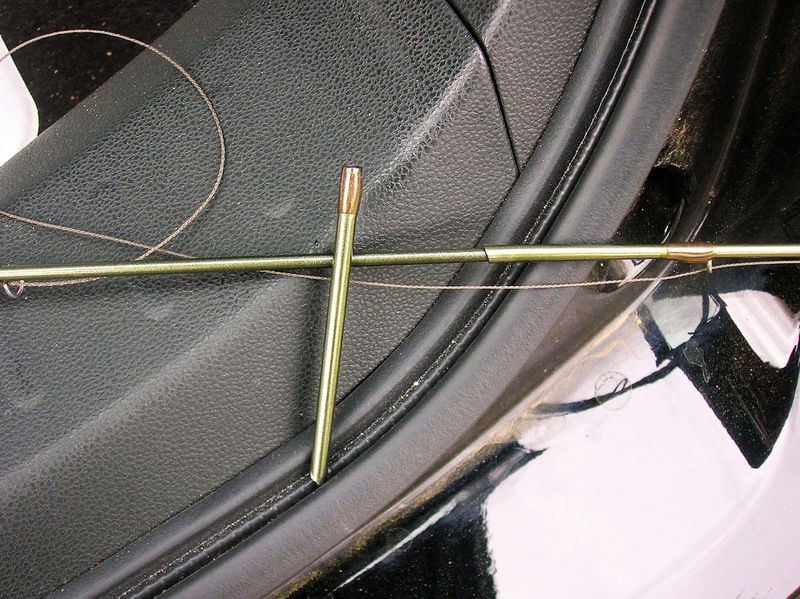 The pattern that was tied was the "pinkie". The fly requires two materials and a hook. 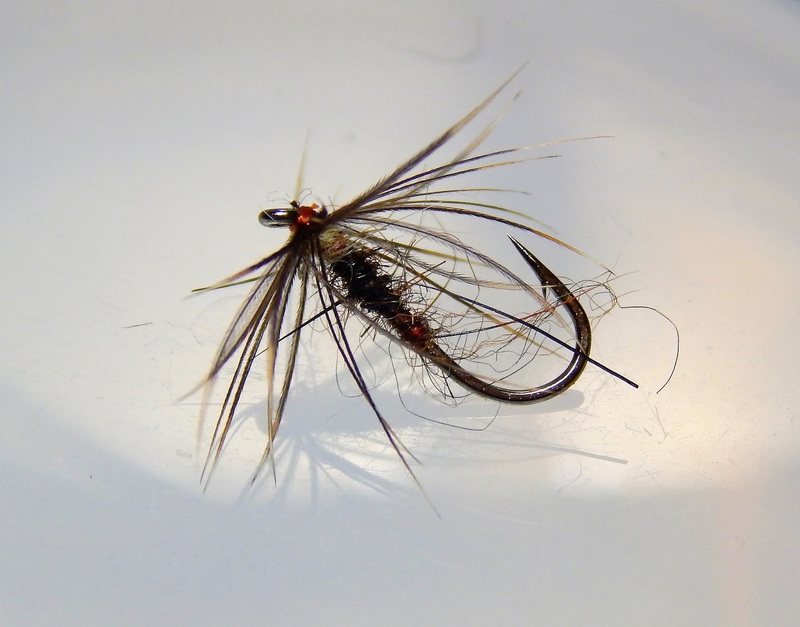 The fly has a multitude of complicated tying moves and the tyers complete concentration. When completed the tyer is allowed to enjoy a beverage of his choice which in my case is a cup of coffee. The fly's materials are hook, thread, and pink chenille. This fly is deadly at times, like every month of the year. A little story. Many years ago while I was fishing a stream I came across a group of children along with their teachers. They were holding a class in the field. I stopped for a spell and listened to the goings on. 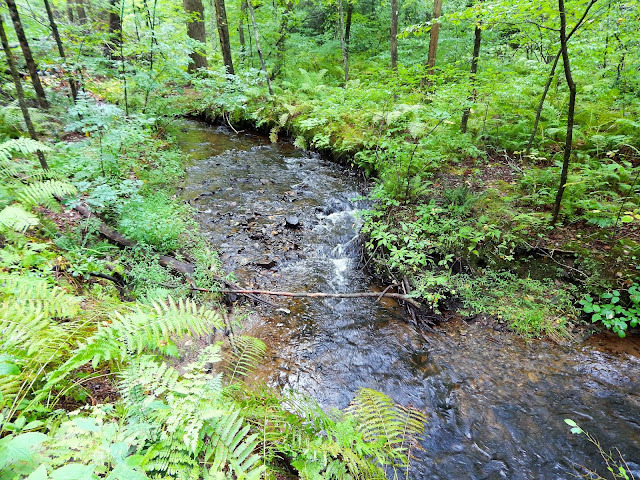 They were being taught the ways of the fields and forest along with the life within the stream. Well they saw me fishing and soon were right along the bank watching me. They were very intent on what I was doing and asked a multitude of questions about my fishing, the flies I was using and the fish I was hoping to catch. As it turned out I managed to catch a brook trout and the excitement in those kids could not be measured. They gathered near the waters edge and watched as I lifted the brookie and showed them. Many oohs and wows were said. 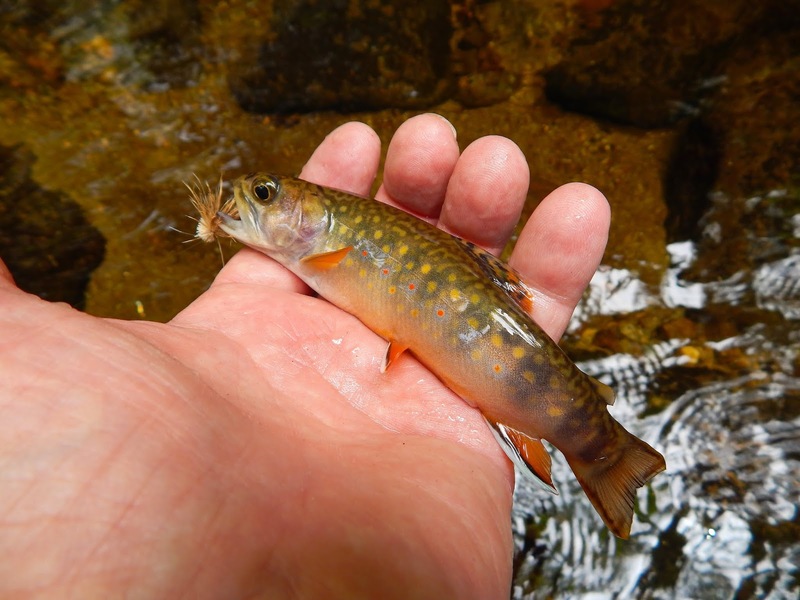 I then let the little brookie go back into the water and he swam off. Lot's of questions ensued..why did you let it go, will he die, are there a lot of fish in the stream, along with many more. While I was answering their questions one of the children stepped on my rod. 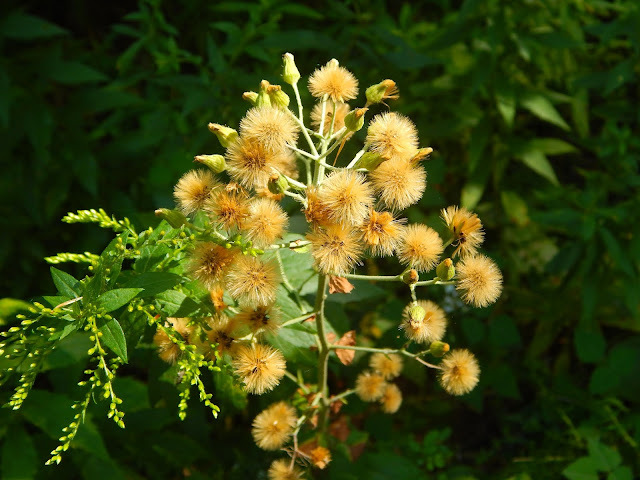 I saw it and did not make much of it instead I stayed with the questions and answered the best I could. Soon it was time for them to move on with their work and they moved to another area. I looked at the rod and said my day is done. Back at the car I saved the broken piece. I managed to fit it as best I could to the other part of the rod. I had no tape with which to bind the repaired rod so I used several band-aids. A few weeks ago while fishing I glanced down and saw something reflecting light at me. 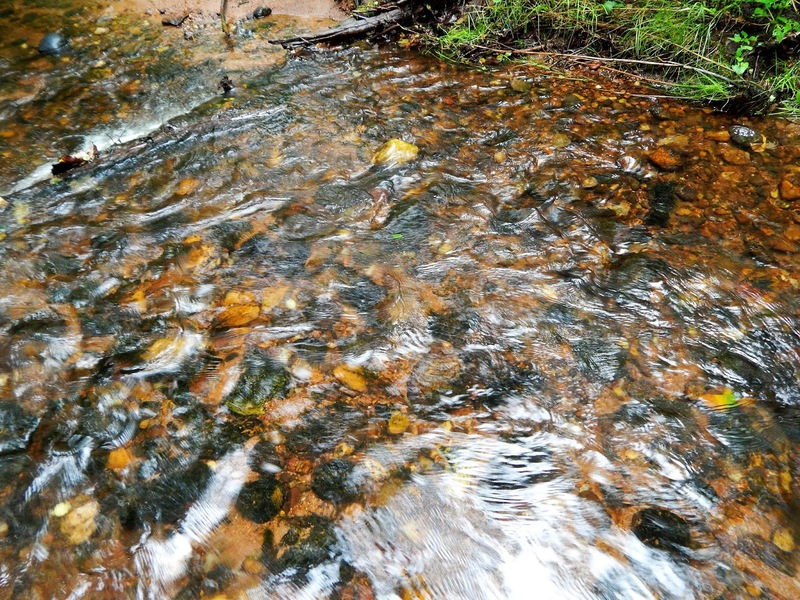 It is not uncommon to see broken glass or a piece of metal along the stream. Curiosity got the best of me and I reached down to see what is was. 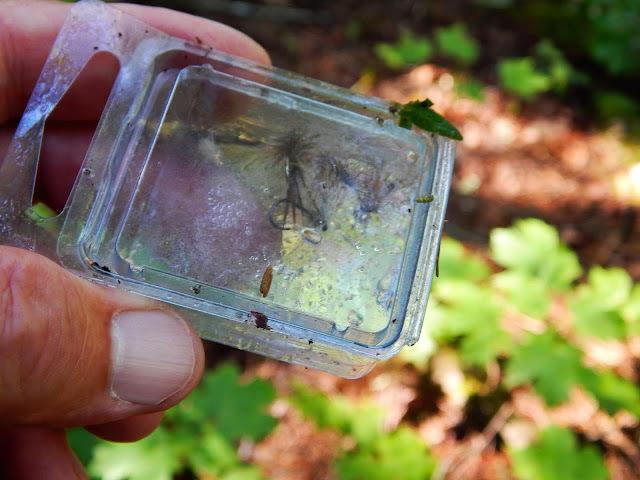 As it turns out it was a plastic box that appeared to have something in it. Taking a closer look I saw some flies in it. I removed the debris from the box and opened it up. Inside were five flies that I recognized as mine. 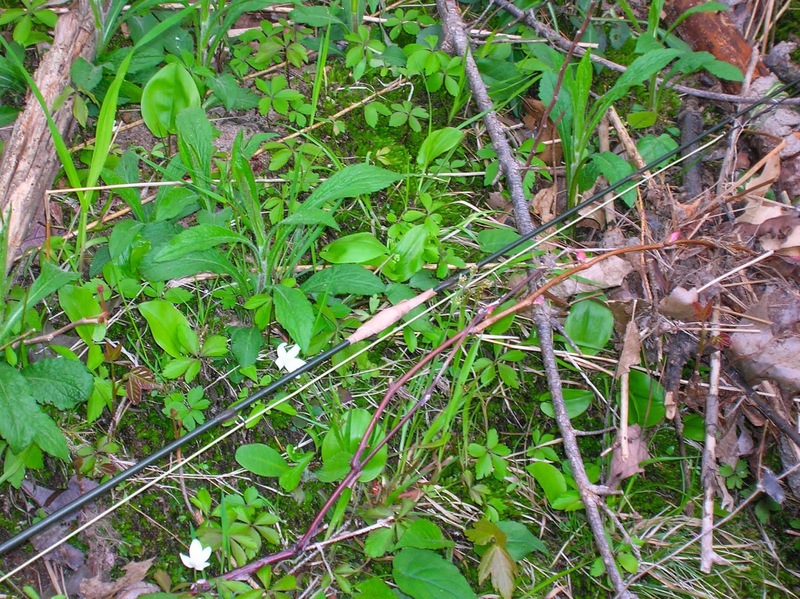 The reason I knew the flies were mine was one of them was a Smokey Mountain Forktail, a fly that no one ties around here. I started to think when the heck did I loose these flies. Over the next hours off and on I managed to piece together a time when I could have dropped the flies. I won't go into how I determined that because I hate typing...rest assured they are mine. Looks like a bomber,a soft-hackle, two elk hair caddis and the forktail. 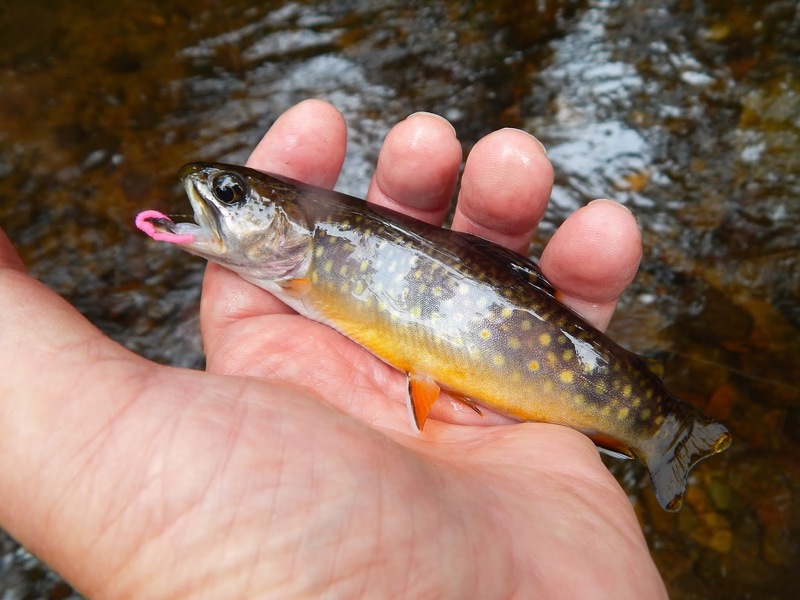 A soft-hackle fooled this native brook trout. There's a stream or two coming off those mountains. Connecticut is not a mountainous state, more like a hilly state. We do have a few biggies but they are along bordering states. 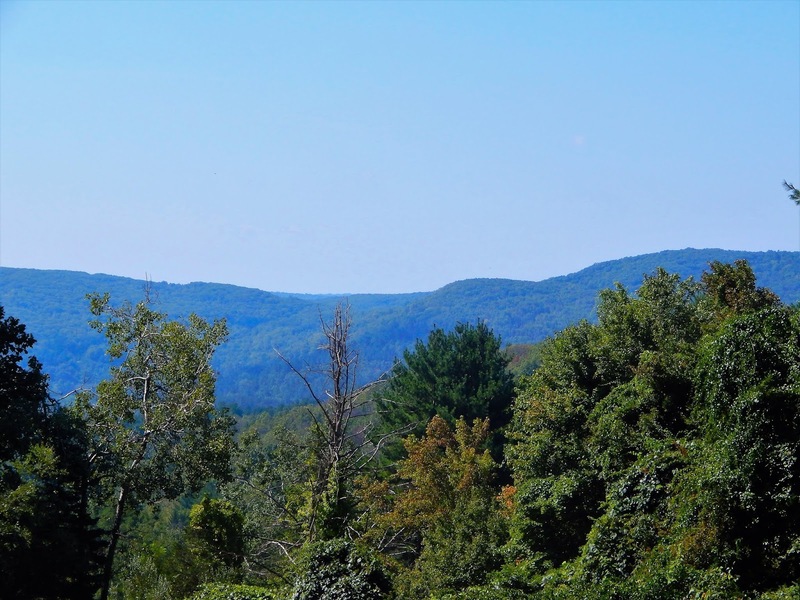 The set of mountains in the first picture are places I've been poking around for the last three plus weeks. 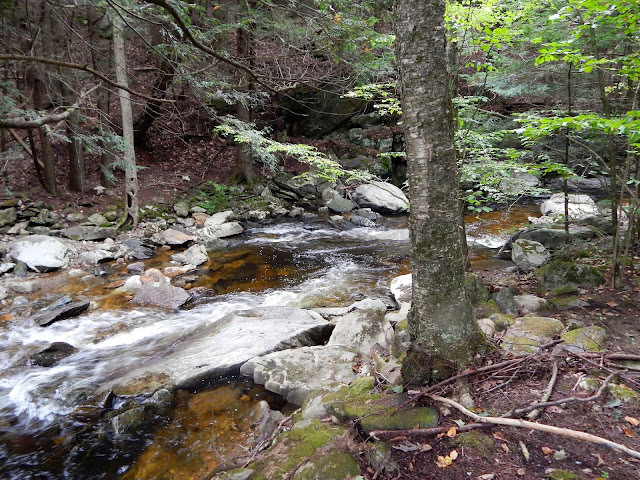 I have found a couple of streams that I've put a few steps into trying to figure out where the fish are. I have found that one of the streams has a healthy population of brook trout, and the other a somewhat good population of brook trout. 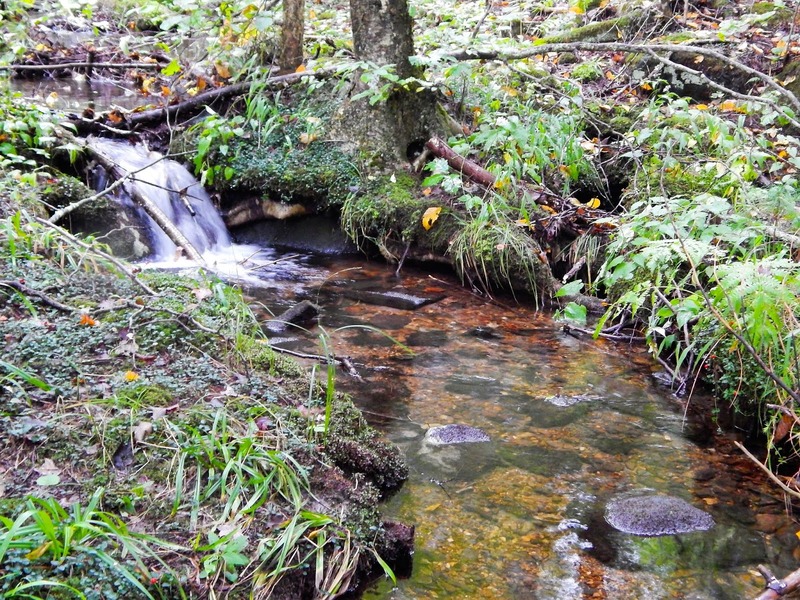 Both of these streams start high up and flow to a larger source. 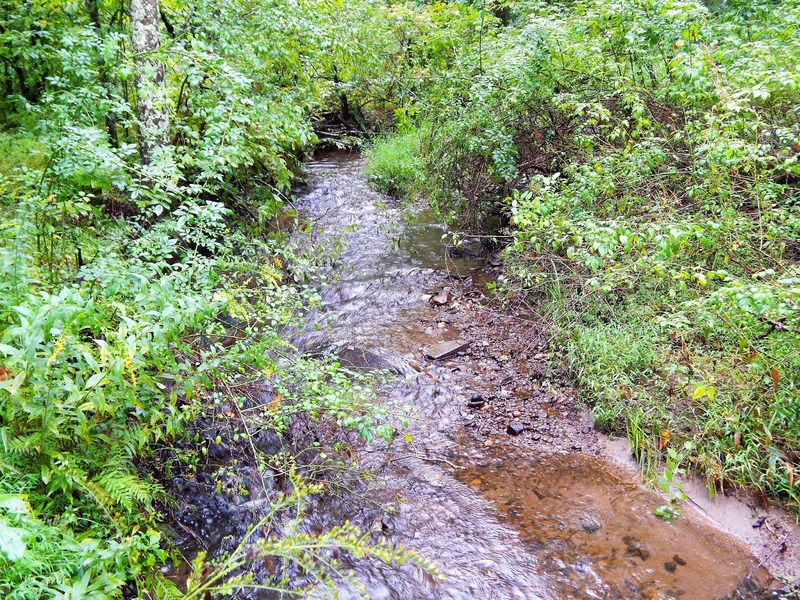 Along the way they pickup volume from underground sources and become a nice flowing stream. These waters have been very cool with water temps in the high fifties, and that's great for the time of year. Still I'm perplexed....the reason will be forthcoming in a couple of weeks. The average flow of a stream in the last couple of weeks. Lots of hiding places in that pool. A brookie taken from a pool just downstream from the photo shown. Yes that's a "bomber" in his jaw. I can't identify them, but they sure are pretty. There are a couple of pools like this on this stream. The currents as well as the boulders seem to corral the sand as it's washed downstream. 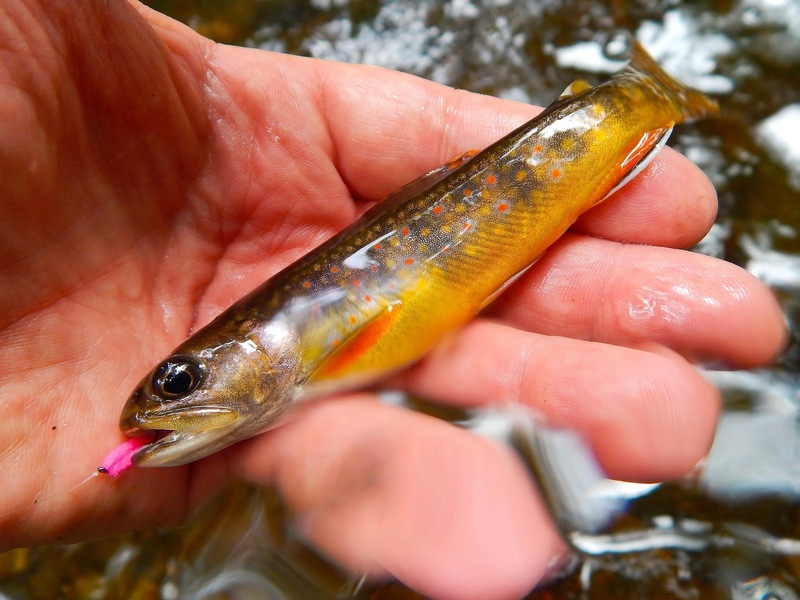 Looking into it one would not think brook trout would consider it to be ideal. I was able to bring two of them to hand and one spit the fly back at me. I'll let you figure out where the fish were taken. 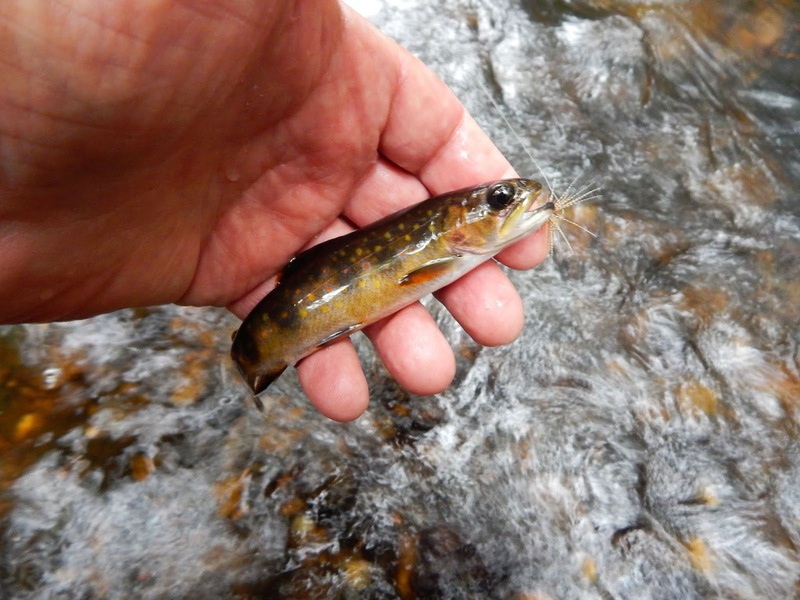 Brook trout like this are what hold in these sandy pools.